The Bavarian revolutions of 1918-1919 – and those in the rest of Germany – were the first to take place in an advanced capitalist country. Inspired by the Russian Revolution, whose centenary is marked this year, they challenged the German state and the established political order. What happened in Bavaria holds important lessons for those struggling for system change today, while the role of the German SPD, the equivalent of the UK Labour Party, in suppressing the revolutions in blood cannot be ignored, especially as the prospects of a Jeremy Corbyn-led government grow. German political thinker and leader Kurt Eisner was the inspirational personality in Bavaria. His life was a compressed microcosm, shaped by the complex experience of revolution in Bavaria and in Germany between 1917 and 1919. It was a time described by the poet Rainer Maria Rilke – himself under police surveillance due to his friendship with Bavarian poet-revolutionary Ernst Toller: “In 1918, in the moment of collapse Germany could have shamed and moved the world through an act of deep truthfulness and reversal. Then I hoped for a moment”. The events that convulsed Munich and surrounding Bavarian countryside between 1918-1919 have been described as “the forgotten revolution”. This year, the 150th anniversary of Eisner’s birth, Munich’s Stadtmuseum has made a great effort to fill this blank spot. Its tribute to the Bavarian Republic’s first prime minister is a brilliantly designed and powerful way of placing Eisner and the Bavarian revolutions on the map. 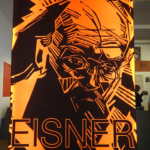 Eisner was born in Berlin in 1867 to a middle-class Jewish family. He began a career as a journalist. His anti-government views led to his incarceration in 1898 for nine months in Plötzensee Prison. Whilst not sharing many of the Social Democratic Party’s philosophical ideas, he became a member on 1 December 1898, and joined the staff of its official newspaper. He reproached official SPD party ideologists for pursuing a policy of “demonstrably doing nothing”. As writer and peace activist Ingrid Scherf has noted, the party leaders “preached the revolution as something that would happen as the natural order of things and as an historical inevitability due to increasing class antagonism”. Eisner criticised the “revisionists” for their reluctance in breaking with the prevailing system. His concept of democratic socialism, Scherf writes, “pro-actively promoted a culture of debate both within the party and with rival pressure groups”. His differences with the SPD leadership led to Eisner’s resignation from his job at Vorwärts, the main party newspaper, in 1905. Eisner initially sided with the SPD’s pro-war political factions at the outbreak of World War I. But within weeks, he changed his view and supported the anti-war opposition in the SPD. In April 1917 he joined the newly-founded Independent Social Democratic Party of Germany (USPD) which was in favour of immediate peace. The Russian Revolution of October 1917 led to the country’s exit from the war and stimulated events in Germany and beyond. That winter, terrible military losses on the Western front and food shortages aroused increased opposition to the war in Bavaria as all around Germany. In January 1918, Eisner’s call for strike action at the Krupps armaments factory in Munich – an astonishing feat for a frail intellectual personality in wartime – received warm support. He was arrested for his role there and, along with other USPD militants was imprisoned. Thanks to the USPD who wanted him as a candidate in the elections to the Reichstag, Eisner was released some nine months later on October 14. Anti-war feeling reached fever pitch in Bavaria. At mass meetings around Munich, Eisner called for unity of the socialist parties, peace, bread, the eight hour day and abdication of the monarchy. Early in November, sailors on the German high seas fleet mutinied, refusing to carry out orders to attack British ships. The anti-war revolt spread from Kiel to Hamburg, Bremen and Lubeck, and now the flame spread south. On 7 November some 60,000 people gathered on Munich’s Theresienwiese (the big field where the Oktoberfest is held nowadays) demanding peace, freedom and an end to the war. On the morning of November 8, Eisner and the USPD Independents took the initiative. Eisner remained on the rostrum at the rally after right wing SPD leader Erhard Auer, who had been against the peace demonstration, moved off with his supporters. Felix Fechenbach, an invalided soldier, called on servicemen to gather around Eisner. Along with the blind peasant leader Ludwig Gandorfer, they led the crowd to the barracks. Novelist Oskar Maria Graf, who took part in the events, described how the crowd opened up the barracks, “freed arrested men and stripped officers of their arms”. Revolutionaries occupied the railway station and other key buildings in Munich. Meeting in the Mathäser brewery, they organised a Constituent Soldiers, Workers and Peasants Council. By midnight of November 8, the council (Rat) proclaimed the founding of the People’s Free State of Bavaria – Freier Volkstaat Bayern. Eisner was appointed first premier and governed with a cabinet in collaboration with the independent self-governing councils (Räte), King Ludwig III was deposed, thus ending the rule of the 738-year old Wittelsbach dynasty. Red flags decorated the twin towers of Munich’s great Catholic landmark, the Frauenkirche. It was a bloodless revolution. A proclamation posted up overnight announced that Bavaria was now a free state. It called for unity of the left and on the workers and citizens of Munich to help self-govern and “collaborate in the new freedom”. For the country as a whole, Eisner’s group called for a “United States of Germany”, including Austria. His 100-day government introduced the eight-hour day, the right to vote for women and ended Catholic church supervision of schools. But it stopped short of economic socialisation, saying that the productive forces of the country were almost exhausted. The banks and major companies remained untouched. Eisner’s cabinet included majority SPD leaders, as well as Independents and prominent professors. 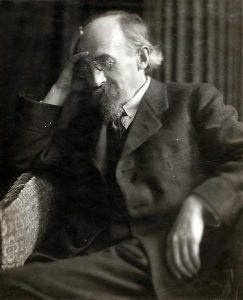 Later that November, Eisner invited anarchist-socialist theoretician and writer Gustav Landauer – a friend of existential philosopher Martin Buber – to come to Munich to help “as an orator in the transformation of souls”. On November 9 the German Kaiser abdicated. Worried that Spartacist leader Karl Liebknecht would declare German a “Räterepublic” (council) republic, SPD leader Philip Scheidemann proclaimed that Germany was now a republic. On 11 November, World War I came to an end. But the SPD’s Ebert-Scheidemann government in Berlin ensured that “the worst representatives of the old order occupy[ied] key posts in the foreign office and the foreign service”, as the new Bavarian ambassador to Berlin reported to Eisner. Reich Chancellor Friedrich Ebert hated and feared the left socialist and communist elements far more than those of the former Prussian state. On 10 November, he made a deal with General Wilhelm Groener, head of the German High Command: the armed forces would be self-governing and Groener would be in command of the officer corps. This pact, and a further deal with big business to end strikes, prevent nationalisation and drive back the influence of the councils deepened the split between the right and left wings of the SPD. In Bavaria, two overlapping administrative structures were in charge: the old civil service and a growing network of workers, soldiers and peasants councils. By December, 7,000 council bodies had sprung up around the country in cities including Nürnberg, Fürth, Würzburg, Schweinfurt, Ingolstadt and Kempten. The industrial centre of Augsburg was controlled by a workers and soldiers council, chaired by 27-year-old teacher Ernst Niekisch. In the 100 days of Eisner’s presidency, a conflict raged over the nature of the state. Should it be a council republic or should there be elections for a parliamentary democracy? Eisner tried to occupy an in-between position – the councils should have an advisory role vis-à-vis the to-be-elected parliament but not an executive or legislative one. Meanwhile, he incurred the wrath of the nationalists and militarists when he published secret documents revealing their responsibility for the war. Eisner, who reneged on his promise of land re-distribution, came under fire from both the right and the left. The lack of support for the peasantry meant that enthusiasm for the revolution was ebbing in the countryside. Right-wing SPD leader Erhard Auer – whom Eisner had appointed as Minister of the Interior – led calls for elections for a constitutional assembly. Eisner agreed to elections for a Bavarian Diet on 12 January 1919. 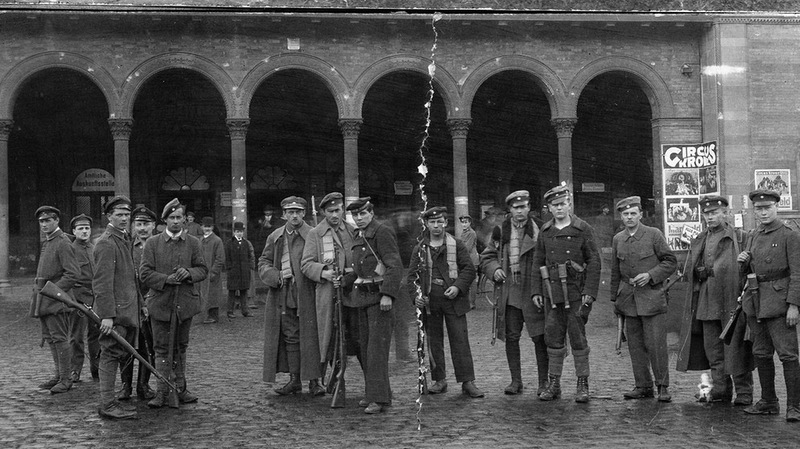 Between Christmas and the New Year, tensions deepened between Auer and Eisner, who tried to hold the factions together, and the Spartacist group, which now formed the German Communist Party (KPD). So much so that, under pressure, Eisner ordered the arrest of 10 left militants – but soon rescinded it. The election – boycotted by the Spartacist-KPD – saw a mass turn-out with many voting for the first time. Women now had the vote and the voting age was down from 25 to 21. The results were an disaster for Eisner’s USPD which received only 2.5% of the votes. He was now on borrowed time: the mainstream press called for his resignation; death threats and anti-Semitic cartoons were posted on walls and in the right-wing press. He tried to strengthen his position by turning to the councils. On 16 February, 15,000 workers, soldiers and sailors demonstrated, headed up by Eisner in an open car. Banners read: “All power to the councils”, “Remember Liebknecht and Luxemburg” (who had been assassinated in Berlin on 15 January), “Long live Lenin and Trotsky”. President Eisner with his wife surrounded by demonstrators, 16 February 1918. Poster reads: Reaction is on the march – long live the council system! Except amongst university students who cheered the news, Eisner’s death sparked a “collective communion with grief” as all Munich’s church bells tolled and life came to a complete standstill. The gulf between council rule – headed by the Zentralrat (central council) – and the Diet (parliament) deepened as Bavaria became a state of dual power. The congress of Bavarian councils met from 25 February in the same building as the prorogued Diet. It was chaired by Ernst Niekisch, a left Social Democrat and a supporter of the United Front, who tried to occupy the middle ground. The spectre of a second revolution now began to haunt Munich. On the eve of Eisner’s funeral on 26 February, a 5,000-strong crowd cheered Rudolf Egelhofer’s call for the permanent dissolution of the Diet, the proclamation of a Bavarian Soviet Republic, the establishment of diplomatic relations with Soviet Russia and the arming of the workers and formation of a Bavarian Red Army. Egelhofer, who had taken part in the sailor’s mutiny in the North Sea, soon became Red Army commander. Under crisis conditions – with food and finance running low – powerful political currents swirled in from outside Bavaria as the dual power situation continued. On 21 March, a Soviet regime took power in Hungary, supported by Austrian socialists. The conflict between the Diet and the Zentralrat deepened. Delegates from all over Bavaria met in Augburg to discuss the “Second Revolution”. 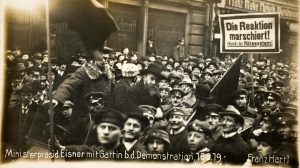 On April 7, USPD members of the Munich Workers and Soldiers council formed the first Bavarian Council Republic, soon to be followed by a second later that month. Activists included anarchist writer-poet Erich Mühsam and Ret Marut (B Traven). The April 1919 events were a sharp to and fro between the forces of the old state and those who sought to bring about a form of council power. The opponents of the Weimar SPD were themselves divided. Minister President and SPD chief Johannes Hoffmann, who had fled to Bamberg, 230 kilometres north of Munich, now tried to topple the Bavarian Soviet with a military putsch on 13 April. This was defeated, thanks to the resistance of the Red Army guards, under the leadership of Ernst Toller. Hoffmann now received the support of Gustav Noske, the War Minister in Berlin, fresh from the bloody crushing of the Spartacus insurrection. Some 35,000 troops now marched on Munich to face no more than 12,000 Red Army soldiers. The execution of 10 right-wing hostages by the Red Guards was used to legitimise atrocities using the combined might of the Freikorps and Weimar government troops. Some 600-1,000 civilians and revolutionaries were mown down. Landauer and other leaders were brutally murdered. Spartacist women were gunned down in Stadelheim prison. Eugen Leviné, who led the 12 April Soviet Republic, was shot by firing squad. A century later and the challenges that Eisner and his comrades faced remain with us in a new form. The old bourgeois political order is in crisis in all the major capitalist countries. Liberal democracy has given way to a neoliberal corporatocracy where state bodies play second fiddle to the demands of financial markets and big business. 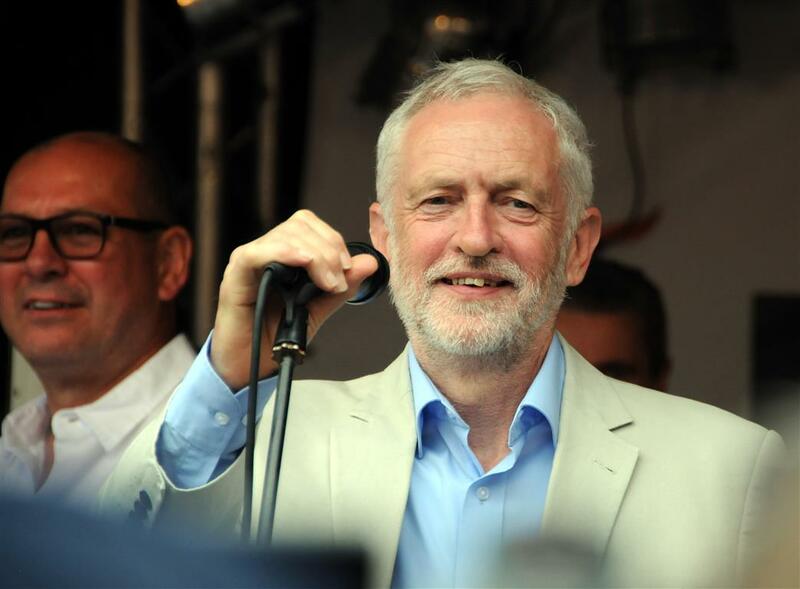 A Corbyn government that implemented radical, alternative policies would – like Eisner – face the wrath of the state and, without doubt, the right-wing of the Labour Party. Their loyalty is to the state and capitalism, not Corbyn and the party. Building a movement that unmasks the state for what it is and develops strategies for a transition to deeper forms of democracy is essential. It is also the best way to cherish Eisner’s memory and achievements. Revolutionär und Ministerpräsident – Kurt Eisner (1867-1919) is at the Stadtmuseum Munich until 18 January 2018. Accompanied by curators guided tours. The programme includes a reading from an autobiographical fragment by Hilde Kramer, who took part in the revolution and eventually died in Britain. Co-curated by Ingrid Sherf and Günter Gerstenberg. With thanks to the Stadtmuseum press and public relations office for their help. 8 November: King Ludwig III deposed. Freistaat declared. 12 January: Elections to Bavarian constituent assembly. Defeat for USPD. 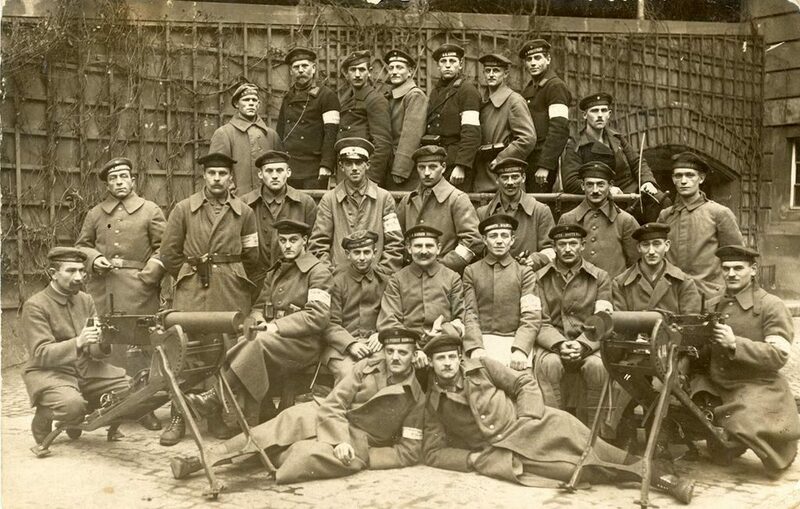 1-3 May: White Terror: 39,000 Freikorps and Noske troops murder 600-1,000 revolutionaries and civilians, only 38 government soldiers died.